SXC. We were overly enthusiastic when we purchased a very large bunch of bananas at an excellent price. But of course, it’s no bargain if half of them spoil. There were far more bananas than we could eat. It’s been too hot to turn on the oven to bake banana bread. And our overstuffed freezer precluded making banana ice cream (one of our favorites!). Fortunately, we received our weekly email from Care2.com—one of our favorite e-newsletters—promising 15 ways to use bananas. Written by Katie Waldeck, we repeat most of them here in edited form. Here’s the original article. We haven’t tried them (except for the banana soft serve), so let us know what you think. 1. Condition Your Hair. Use Dr. Oz’s banana hair treatment. 2. Whiten Your Teeth. Don’t throw away the peel: Rub the inner side on your teeth for about two minutes before brushing. The magnesium, manganese and potassium in the peel will help to whiten your teeth naturally. 3. Make A Facial Mask. An anti-aging mask made from mashed bananas, heavy cream, honey and oat flour? Sounds like banana pudding! Here’s the recipe. Don’t let the dog get too close. 4. Make A Sugar Scrub. Whip up a scrub to exfoliate your skin. Here’s a recipe. Make a double batch and bring some to a friend (keep it in the fridge until ready to use, and use it within a few days). 5. Insect Bite. If you don’t have any cortisone cream or other medication, rub the inner banana peel on the bite to alleviate the itch. 6. Splinter. Press the inside of the banana peel onto the splinter. The fruit’s natural enzymes are said to raise the splinter so you can remove it more easily. 7. Polish Leather & Silver. Rub the banana peel on the item and buff with a cloth. Hmm…test it on older shoes before trying it with the Louboutins. Bananas growing on the tree. Photo by Sergio Roberto | SXC. 9. Dog Treat. 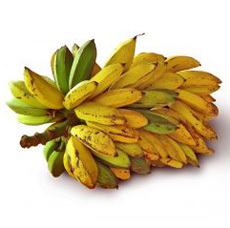 Bananas are a perfectly safe, and perfectly healthy, treat for your beloved pooch! 10. Make “Soft Serve.” Turn those extra bananas into a healthful and lower calorie approximation of soft serve ice cream. Make as much as you plan to eat at one time. PEEL the bananas and cut into small pieces. FREEZE for 2 hours and toss into a food processor. 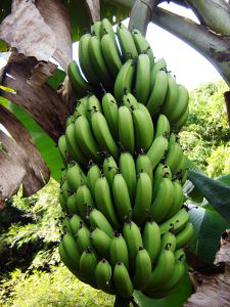 The banana “tree” is actually a jumbo perennial herb with huge leaves. The word “banana” is derived from the Arab word for finger, “banan,” referring to the fact that the bananas in a bunch look like fingers. Enjoy more banana trivia and the history of bananas.